What to do with tag-only edits? Here's the suggested edit in question. The OP was asking about security on a shared WiFi connecton. They had it tagged as 16.04, firefox, and security. An edit came up that only changed the tag 16.04 to networking. No changes were made to the actual post. Should such an edit be denied? If the edit is appropriate and useful and nothing else needed editing, approve it. This can only be answered in a very general way, because there's no specific edit suggestion* to look at. In general, it is often appropriate to perform a tag-only edit, so it's often right to approve such edits. 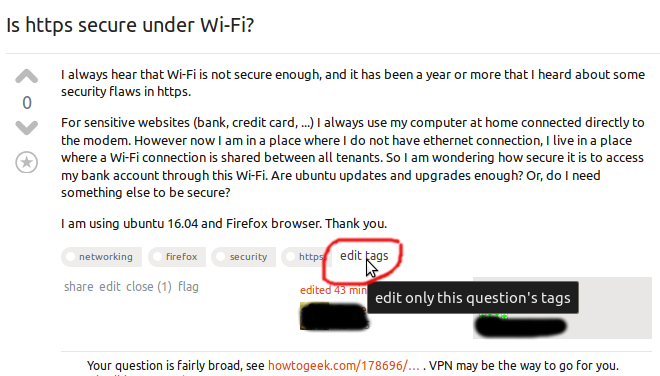 When I edited this meta question to add tags, I was really hoping I wouldn't find anything else to improve, so that it would be a tag-only edit. (That would have made this answer more fun.) Since I believe the tags I added here--tags, editing, review, and suggested-edits--are all relevant and useful, I would have gone ahead and done the edit even if there were no other changes to make. Even if I had just been adding one tag, if I thought it was relevant and useful, I would have made the edit. Unlike the main site, the meta site supports suggested edits only for tag wikis. But if it supported them on posts and someone had suggested the edit I had made, or one very much like it, I would have approved it. Similarly, I would approve an edit that just removed a tag, provided there was nothing else about the post that needed fixing and that the tag it removed was not useful. For a post like this meta post where there where the other things that benefited from editing were not big problems, I would have clicked Improve Edit and made the additional changes. You should always be willing to click Improve Edit when an edit would otherwise be worth approving but you think a further edit is helpful and you are willing to stand by both the parts of the suggested edit you choose to keep as well as your own changes. Normally I would recommend only using Reject for edits that don't improve a post or Reject and Edit when it is more efficient to discard the suggested edit and start over (which is what Reject and Edit currently does). However, if you come upon a suggested edit that, while correct, is trivial, and the post has major problems the edit does not fix, I think it is reasonable to click Reject and Edit, and usually even best to do so. This is not at all specific to tag-only edits, though. In practice, most trivial edits on posts with other major problems probably aren't tag edits. A few thoughts about version (release) tags and networking-related tags. I usually assume that a version tag that exists on a question may be useful, and don't remove it, if the post appears hardware-related, unless I am confident that the question isn't release-specific. For other posts, I would usually remove a version tag if I think the question isn't release-specific and I could cogently explain why if asked to account for having removed it. Rarely if ever do I (deliberately) remove version information from a question, but it can be added into the body if not already present while removing the tag. Because some networking questions are quite hardware related, I would not assume the question isn't release-specific even if it looks a lot like other questions that aren't. So for the question you encountered, I can hardly guess if I would agree with the removal of 16.04. But even if I didn't agree with removing 16.04, it's likely I would have clicked Improve Edit and undone that one part of the change if I agreed with the other tag changes (in this case, the addition of networking) and there were no glaring problems with the post left unfixed. NB this question was related but different. It asked if tag edits should let voters undo votes. * A link to the specific edit has since been added to this meta question, but I think this post still stands pretty well as a general answer. I expect others to post answers here about that edit in particular. I agree entirely with Eliah Kagan's answer. In addition I would like to point out that the importance of correct tagging is underlined by a nifty privilege you get at 10k reputation. Since questions are often tagged wrongly, I often use this tool to edit only tags. Questions with irrelevant tags, or lacking relevant ones, are less likely to be seen by the many experienced users who follow particular tags and are likely to answer questions in their area. So, a tag-only edit can be very useful. Not the answer you're looking for? Browse other questions tagged discussion tags editing review suggested-edits . When should we use the versions tags? Version tags are being used improperly — what to do? When is an edit too minor? Should re-tagging really be considered as edit? What to do with useless new tags? Can we make the tags more visible when reviewing suggested edits? What if the Community user doesn't make it in time to reject my suggested edit before another user rejects it? What tag should be used for “first-timer” questions?